Lawsuits can be extremely expensive. Negotiating settlements allows parties involved in a dispute to attempt to settle the matter without having to go through the legal process and procedures of a formal lawsuit. Moreover, it allows the parties to control the process and outcome. However, for settlement negotiations to work both parties must voluntarily participate in good faith to attempt to reach a mutually agreeable resolution. The negotiation process can happen through the parties and/or their lawyers and also with a third-party, such as a judge or mediator. Our Chicago business litigation attorneys regularly assist clients in successfully negotiating and mediating cases. One of our firm’s greatest strengths is our Chicago commercial litigation practice. Whether in the courtroom, mediation, arbitration, or at the settlement negotiation table, our attorneys are known for their skillful handling of matters. From negotiating or litigating small issues for clients to the coordination of complex litigation of multiple claims in jurisdictions within and outside of Illinois, our lawyers bring thoughtful and practical experience to achieve desired results. 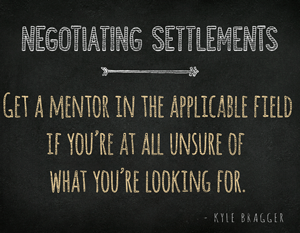 The three biggest advantages of negotiating settlements is flexibility, cost effectiveness and minimizing risk. Negotiation is usually the most flexible form of dispute resolution, because the parties, aided by their attorneys, are able to shape the terms of their agreement to fit their own needs, including but not limited to timing and forum. When the parties are both comfortable with those aspects (timing and forum) of the negotiation, the chances of reaching an agreement are enhanced. If the parties adhere to and respect the timing and forum requirements, they can avoid the oftentimes strict timing and forum requirements that would otherwise be present if the parties were formally litigating in state or federal court. Settlement negotiations are usually less costly than formal legal action. Formal business litigation can be costly and time consuming. Negotiating settlements instead of litigation can help the client avoid costly legal action and can reduce the delays that occur in litigation. Finally, when the parties agree to negotiate and do successfully negotiate, they have both essentially eliminated, or at least reduced the risk that is inherent in proceeding with formal litigation. With formal business litigation, both parties have risk. Ultimately, the fact finder (judge or jury), if left to determine the outcome, could rule in favor of either party. If the parties instead choose to negotiate and reach a resolution that is acceptable, they avoid the risk of adverse rulings and judgments. Confidentiality is another factor to consider. With formal legal action, the dispute is less likely to be confidential. However, negotiating a settlement – and the ultimate settlement agreement – can remain confidential. One of our firm’s greatest strengths is our Chicago commercial litigation practice. From negotiating settlements or litigating small issues for clients to the coordination of complex litigation of multiple claims in jurisdictions within and outside of Illinois, our business litigation lawyers bring thoughtful and practical experience to achieve desired results. The parties to a business dispute can agree to negotiate through counsel or with a judge or mediator. Typically, counsel for both parties will attempt to discuss the differences and parties’ positions and will attempt to reach an acceptable settlement instead of pursing the lawsuit. If the parties agree and if counsel is unable to reach an agreement, the parties might also choose to have a judge or mediator step in to help resolve their dispute. There are a number of organizations that provide mediation services to help resolve disputes. Contact our Chicago law firm to discuss the forum that works best for your legal dispute. Judges in virtually all jurisdictions make themselves regularly available to assist parties in negotiating a dispute. This is true whether or not formal legal action has commenced. What a judge can provide, after reviewing both sides of the dispute, is a neutral opinion regarding the strengths and weaknesses for both sides. The Judge can also suggest a reasonable settlement number and/or outcome for the parties to consider. This is only a suggestion and not a requirement, however both parties should remember that judges have tremendous experience with disputes and their “suggestion” might just end up being what the ultimate outcome would look like. It is important to remember, therefor, that in attempting to negotiate, both parties must have a “give and take” mentality. Mediation is another common option for attempting to negotiate a settlement. Our Chicago law firm has represented numerous business and individual clients in mediations and arbitrations. Results can vary, but mediation can prove to be very effective and more often than not will lead to a settlement. Mediation is a negotiation carried out with the assistance of a third party, usually a former/retired judge. The mediator, unlike an arbitrator or judge, is not able to impose a solution on the parties. The mediator merely aids in the resolution of the dispute by guiding the parties through the negotiation, encouraging exchanges of information, and providing other thoughts and opinions on both parties’ positions. Mediators provide unbiased opinions based on their many years of experience. Mediation is almost always informal and can last anywhere from several hours to several days or more. While mediation is informal relative to arbitration or litigation, legal counsel can prove to be extremely valuable. Our Chicago business litigation lawyers not only advise clients during mediation, but also assist clients in drafting and finalizing settlement agreements negotiated during mediation. Negotiating a settlement can, and should most often remain confidential. Any settlement agreement reached between the parties can contain, in addition to the other standard and agreed-to terms, confidentiality clauses to make certain the agreement and outcome remain confidential. Our law firm has assisted clients with the mediation of cases involving breach of contract, breach of fiduciary duty, legal malpractice, unfair competition, employment disputes, restrictive covenants (non-competition, non-solicitation), business fraud, among others. If you or your business need advice on whether to negotiate and settle or fight the case and push forward, contact our Chicago law firm. Our litigation attorneys regularly handle matters in state and federal courts throughout Illinois, including Cook, DuPage, Kane and Will Counties. For additional information please contact us at (312) 789-5676 or by email.